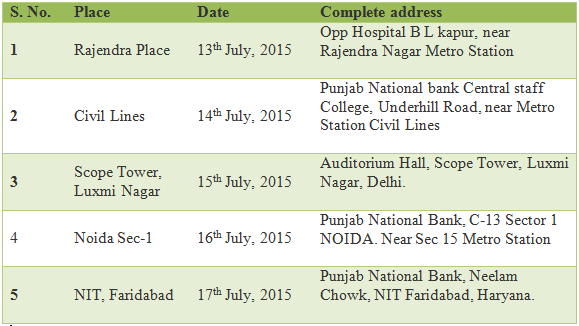 The Department of Pension and Pensioner’s Welfare will hold five Aadhaar Seeding and Regularisation for pensioners in Delhi NCR in collaboration with Punjab National Bank from 13th to 17th July, 2015. These camps will be held at Rajendra Place, Civil Lines, Scope Tower – Lakshmi Nagar in Delhi and Noida Sector 1 and Neelam Chowk, Faridabad respectively. Pensioners residing in the Delhi NCR may visit an Aadhaar Camp on any one of the days with original PPO, Aadhaar Card, and bank pass book along with photocopies of these documents.